The best time of year is all year long. Chinese New Year is one of the most important annual events for Richmond’s Chinese community. Lions and dragons twist and dance to drums, cymbals, and cheering crowds. Restaurants introduce special banquet menus and quickly fill their reservation books for extravagant, multi-course feasts. Richmond’s malls and plazas fill with flowers and gifts, cultural performances, family activities, and so much more. Spring Break activities take place throughout the month of March at Richmond&apos;s attractions, historic sites, and community centres. There is always a full slate of kid-friendly things to see and do, along with some fun events to check out such as the Lansdowne Centre Outdoor Spring Carnival. Set sail from Steveston on a whale watching tour for a chance to see resident orcas (killer whales) along with humpback and grey whales, sea lions, seals, bald eagles, and more in their natural marine habitat. This open-air seasonal market is held on certain Sundays, featuring fresh produce, handmade jewelry, artisan crafts, and live entertainment. The market runs May through September in the parking lot across from the Steveston Community Centre. On weekends, the Richmond Night Market offers clothes, gadgets, and other merchandise alongside booths serving sweet and savoury street food and exotic drinks, all set to a soundtrack of live music, vocal merchants, cultural performances, and carnival games. While the night market runs through the spring and early fall, it is most popular in the summer, thanks to Richmond’s pleasantly warm weather. Richmond’s annual arts, culture, and heritage festival offers free activities and experiences to visitors and locals of all ages at up to fifty partner sites. These include National Historic Sites, museums, places of worship, art studios, city facilities, and specialty businesses. Canada’s “biggest little birthday party” draws over 70,000 people to Steveston every year. It kicks off with a pancake breakfast and parade, followed by a variety of exhibits, demonstrations, and live music and performances on the main stage and the children’s festival stage. Finally, the festivities are capped off by a big fireworks display. There’s also the famous salmon barbecue, where more than 1,200 pounds of fresh salmon is grilled over open fire pits. This free, two-day family festival for seafarers and landlubbers alike gives you the chance to explore the city’s maritime history at the Britannia Shipyards National Historic Site. Exciting live performances, interactive displays, and a lively atmosphere pair with dockside boardings of beautiful and historic wooden boats, a local artisan market, storytelling, and colourful maritime characters wandering the grounds giving spontaneous performances. One Sunday every August is dedicated to this annual celebration at London Heritage Farm and features a petting zoo, pony rides, face painting, live entertainment, a bake sale, and live entertainment. This free event at Minoru Park celebrates Richmond’s cultural diversity through music, food, sport and culture. Festivalgoers can eat their way through the region’s tastiest food trucks, shop the artisan market, and watch live musical and cultural performances at this award-winning festival. Culture Days is a Canada-wide annual celebration of arts and culture, often taking place over three days at the end of September and beginning of October. Past years have featured more than 90 free activities happening all over Richmond, each one offering a glimpse into the world of local artists, curators, writers and other creative producers. Be sure to take one of the “haunted” tours of the Gulf of Georgia Cannery National Historic Site, a spooky (but fun) take on the area’s maritime history. Another local favourite is the Pumpkin Patch at Richmond Country Farms, where tickets include live entertainment, a ride in the hay wagon, a visit to the animal farm, and a fresh Spartan apple—all this, plus your chance to pick a pumpkin! There are also free fireworks displays on Halloween night, alongside many city-run events throughout the month. 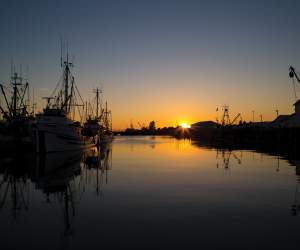 Foodies take note: Steveston’s Gulf of Georgia Cannery National Historic Site hosts this market every other Sunday from October to April, featuring fresh produce, baked goods, handmade jewelry, and arts and crafts. The Cannery Farmers’ Market adheres to the ‘make it, bake it, grow it, catch it’ philosophy, only offering approved products produced or harvested by an approved vendor in BC. The most wonderful time of the year is made even better in Steveston! There’s the Festival of Trees at the Gulf of Georgia Cannery National Historic Site that runs all month long, a meet-and-greet with Santa as he arrives by boat at Fisherman’s Wharf during the ‘Christmas in Steveston’ event, and the annual Santa Claus Parade on December 24. Add Richmond’s most well-known and well-loved attractions to your bucket list.